No matter how and why you use your computers for, the one function that you can never fully outgrow is emailing. Despite the advent of many and varied messaging tools and social media services, all of them lead back to the need for an email. Emails truly has survived the test of time. In fact, there is even a greater need for emailing today when almost everything has turned digital and gone online. Not only does email remain a staple way in communicating, it’s where we store tickets and get receipts of our online transactions, what we use for setting appointments and get our reminders. Most of us do hop over to and from different email accounts, and thus there is a need for keeping those pesky accounts in line and easily accessible to us at all times. A good desktop email client allows you to do this with convenience and gives you reliable backup access to your messages offline. MacOS, of course, maintains the native Mail app. 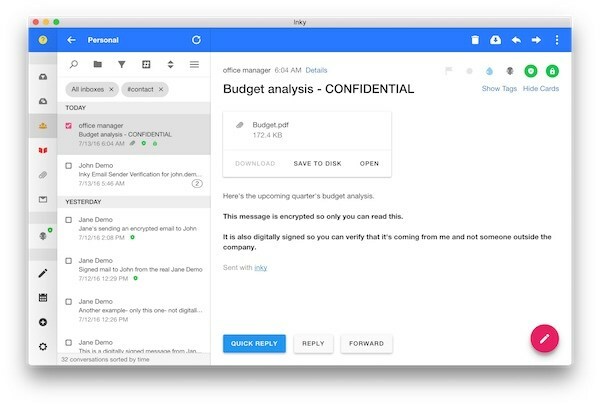 The native Mail client has improved consistently over the years, but we believe you are better served with email clients that were developed solely for the purpose of giving you powerful tools and functions at your fingertips. Some third party email clients are paid, while some are free, and some are available for your web-based browsing or desktop needs. 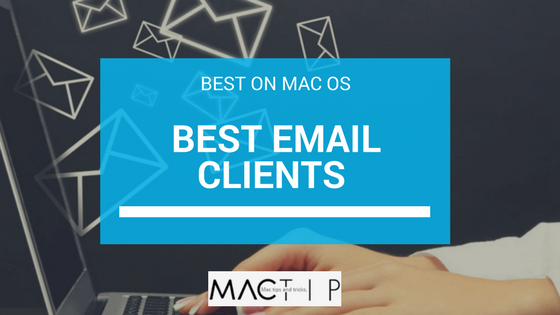 Take a look at our 10 best email clients that work for macOS. We’ve taken the time to evaluate based on ease of use, design, sync-ability and other criteria that we’re sure you’d appreciate and thank us for. 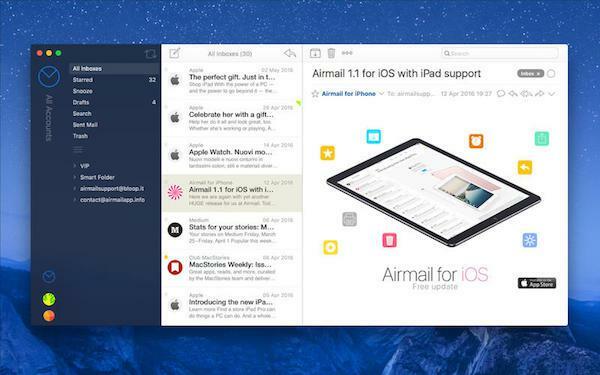 Airmail tops our list for the best macOS email client, and probably everyone else’s–for a good reason. The developers of the app describe the Airmail experience as one that is “quick, modern and easy-to-use,” and that rings true with its clean design and intuitive interface. Airmail provides the service you’d expect from a good mail client with great speed and stability: good support for multiple email providers, quick switching between accounts, and ability for quick replies within seconds, multi-language support, among many others. It also provides a huge range of functionalities as well, the notable ones which are: a highly customizable filter system, folder and account management, multi-touch gestures, undo history, and support for interaction with the productivity app of your choice, like Calendar or Evernote. You can find many people vouching for its efficiency and performance, including a good customer support that helps you answer your queries in real time. Airmail is several steps ahead of your native Mail app in macOS that it takes your emailing experience entirely to the next level. You can get Airmail as your email client for your iPhone and iPad devices as well, and has Handoff support. It also has iCloud sync and iCloud attachment upload and share ability. Unibox stands out from other clients in this list for its unique approach in organizing your emails: using Unibox, you can toggle your emails by the person you’re interacting with rather than per subject or per thread (though you can toggle it in either of those ways, too). This way, you’re given a view of the context of your conversation history and you can easily find what you’re looking for. 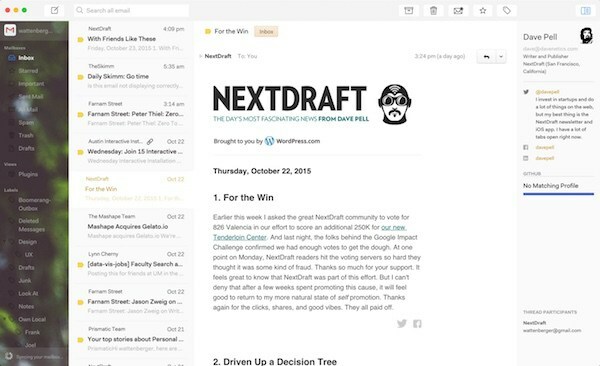 The UI is slick, and the way it automatically organizes your email may be the fresh approach to emailing that you didn’t know you were looking for. It also features your usual email client features, such as multiple email service support and multiple account support, a unified inbox, POP3/IMAP, and quick actions option. Its attachment grid, where you can see all the attachments that has been sent to you, is a pretty nifty feature to have. There is an iOS app version of Unibox that you can download on your Apple devices, if you’re sold on using this client. On the flipside, its approach to email management may not be your cup of tea, and there are reports of multiple bugs, so you’d have to try it out and see. On the other hand, if your biggest concern isn’t security but efficiently averting email overload, then Postbox is the client you may want to try out. It has a minimalistic UI which simplifies your email organization with a clean view. 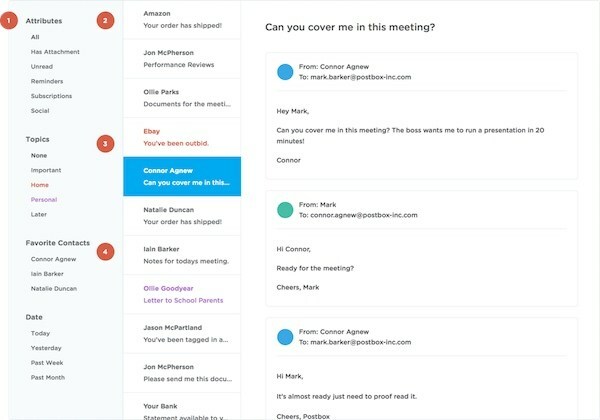 It boasts of an innovative Focus Pane that creates a separation between emails of different attributes; the Focus Pane allows a separate category for email that has attachments, and emails that have reminders, or emails regarding your subscriptions, for instance. It can also break down your inbox per topic and other meaningful labels that you can customize for yourself. Your favorite contacts also get a spotlight in the Postbox Focus Pane. Other tools available in Postbox include a powerful search, organization via tag and by contact, real-time filtering, quick replies and templates. Also a notable feature is its tabs support that allows you to stay focused on a chunk of organized mail one window at a time. Postbox is available for macOS and Windows, but for a costly $20 which may well be worth the price for saving you the potential headaches of a cluttered inbox ahead of time. 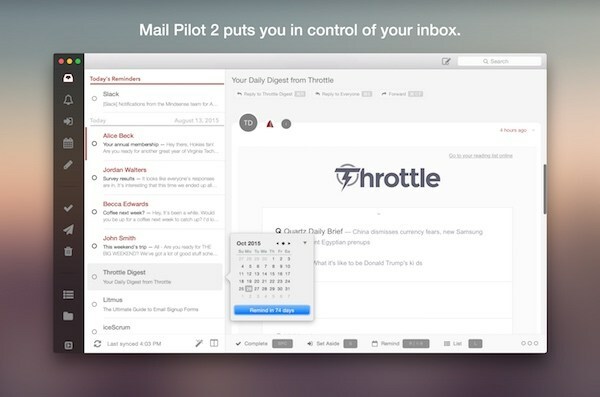 The defunct Mail Pilot 2 garnered some very good reviews and was even featured on the Mac App Store front page, and now its new and improved successor, Mail Pilot 3 is incoming. For Mail Pilot enthusiasts, you don’t have to worry, as it still promises to remain true to its Mail Pilot method, which has something to do with the way we interact with mail. It presupposes that all sort of mails are associated with an action, and thus all mail could be either “complete” or “incomplete”. Basically, Mail Pilot serves as a big to-do list, where you can mark messages as actions that have been completed, which automatically archives those messages and reducing your inbox clutter. You can also set messages as reminders, for those actions you know you have to complete at a specific time in the future, group messages as a task list, and process those at the same time, or set aside an email that you aren’t sure when to complete it on. Mail Pilot is a unique program and a mentality all on its own. 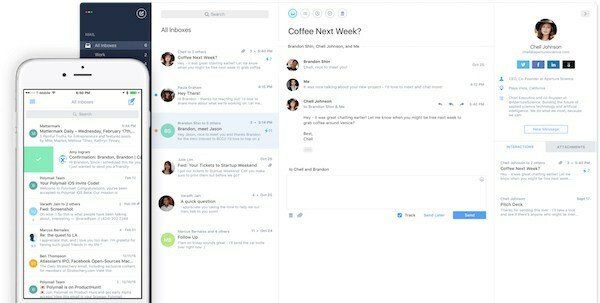 Mail Pilot 3 promises to be a smoother and well-engineered software, according to its developers, and if its ingenious way of dealing with email interests or boggles you, it’s worth it to stay tuned to its anticipated release. Nylas N1 presents a curious case, as it is open source, which means the coding used in this client is available for free to people who can redistribute and modify it, or deploy it in an environment of their choosing. This tidbit aside, it hosts decent features that make it a standout email, scheduling, and contacts toolkits. Its most notable feature is its automatic sync with no manual data entry required. Nylas N1 is idea for big organizations, given that it has Mail-Merge built-in support, customizable email workflow, and a built-in actionable analytics that can track open and click through rates and replies. If you’re looking for an email client for your enterprise needs, you may be well served by Nylas N1. 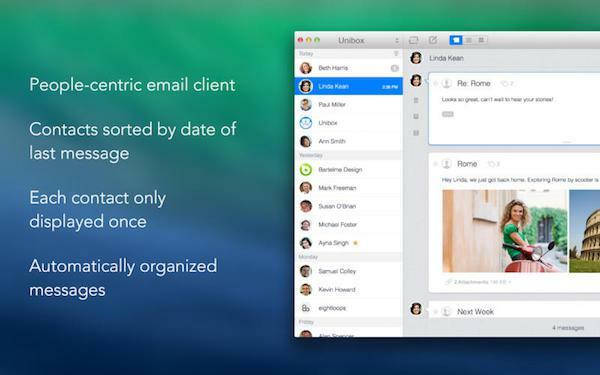 Usual tricks aside, such as a search function, unified inbox, multi-service provider support, aliases, and the likes, Nylas also has calendar integration and tracking, as well as message scheduling and a variety of plugins for an enhanced user experience. That’s probably the benefit of being open source. Polymail is well-loved for delivering great functionalities to the average user, even though it’s geared for organizational and collaborative use. It enables great control through its many powerful features such as real-time tracking, scheduled emails, undo send, a snooze email option, live email stats, automatic reminders, and a single-click tool to unsubscribe to emails you just don’t want to see any more in the future. Its interface is neat and easy to use, plus has an amazing profile feature on every person you have an ongoing conversation with, including their social links and past interaction history, so you know who you’re talking to in every thread. Its analytics and tracking are touted by its developers to be Polymail’s strengths, but it’s still great for individual use. Canary puts premium on ease of use and security, while still putting up an elegant interface that’s very pleasing to the eye. Its email encryption feature is highly flexible as well: you can either use its one-click encryption that allows you to encrypt the email easily, and have the email be automatically decrypted to its receiver, or you can choose to manage your keys and exchange encrypted emails with anyone. For more advanced users, PGP keys can be set manually and manage those through its built in key manager. Canary does those while leaving only a small memory footprint. Aside from packing all the usual email features such a unified inbox and multiple-account integration for Gmail, Outlook, Yahoo, and every IMAP account out there, and there’s also the cool ‘snooze’ emails feature that retrieves your emails back to your inbox at a time of your choosing, to better manage your email load. It’s available for your iOS devices too, so you can install it in your Apple device of choice for only a relatively small price. support for the usual email services such as Gmail, Yahoo!, Outlook, Office 365, and many others. 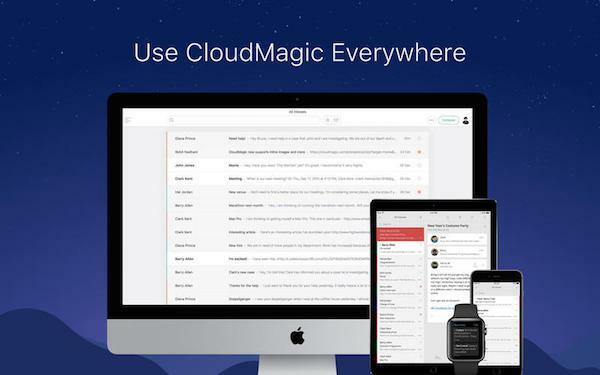 A huge downside of using CloudMagic and Newton is that it has a subscription-based model, and you have to pay a whopping $49.99 per year to continue using it. If the price tag isn’t a deal-breaker for you, you might want to consider subscribing for this solid contender. If internet and email security is a big concern for you, then Inky is your safest bet. Inky is marketed as a mail protection gateway. It scans and blocks spam, phishing, cross-site scripting attacks and malware, and its most basic level, allows you to have a secure and private email through its focus on a digitally signed and encrypted email. In this sense, Inky is more than an email service as it acts like a line of internet threat defense as well. Nevertheless, Inky does give you support for multiple accounts and a unified inbox, many customizable filters and a cloud for profile settings for your cross-devices email protection needs. Inky comes in three different versions: a free one, the Pro tier that costs $5 a month to protect your Google Apps, Office 365, MS Exchange and other IMAP services, and an Inky for Enterprise for your organizational use. Mailplane is a veteran player in this field, having been available for download for over 10 years! It comes with a huge caveat though: it can only support Gmail and Google apps. 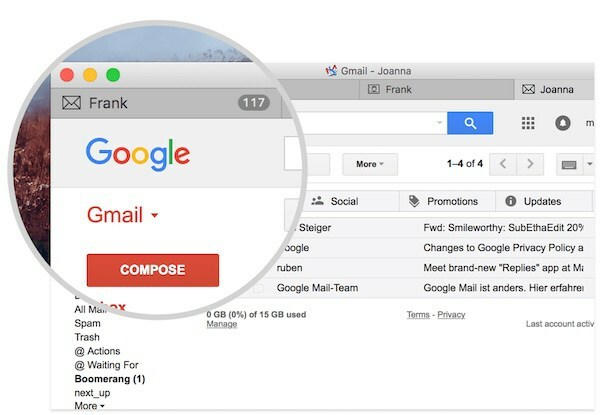 Regardless, Mailplane remains in our list, because both Gmail and Google Apps are the very widely used, and Mailplane integrates the functionalities of these apps while elevating them through its native tools and features. Some of its subtle features include multi-language support, notifier in the Mac menu bar, preview and annotating directly from the Mailplane interface while having the option of using your Mac apps of choice rather than Google’s third party apps, and the ability to use extensions and third party integrations such as Gmail plugins and other programs such as Evernote, Apple Photos, Apple Script, Todoist that will optimize your Mailplane experience. A runner up to this list deservedly goes to Thunderbird, developed by tech powerhouse Mozilla, and it is open-source, highly customizable and loaded with most of the powerful features you’d find in any of the items in our list, even though it doesn’t have the most modern design. 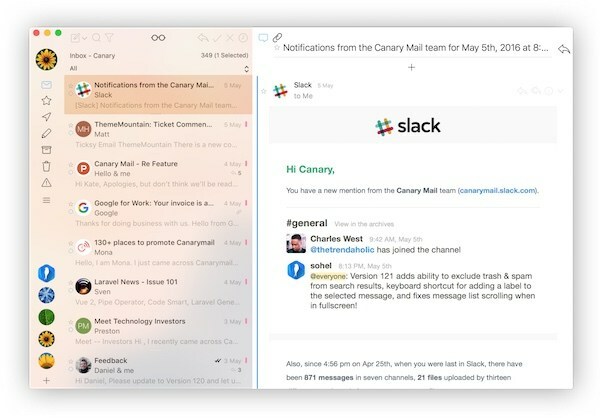 While the native Mail client of macOS may get the job done, especially with every update and versions of macOS that adds to its capabilities, there’s something to be said for third party apps that were crafted from the bottom up to create a more impactful and powerful emailing experience. Now that we’ve shared with you our 10 Best Email Clients for macOS, let us know if we’ve missed any of your favorite email clients or if we’ve hit it spot on. Share your thoughts in the comments section below. As a long-time Thunderbird user, because I have a number of local Thunderbird folders containing important stuff, I need to be able to import those folders into the new one (whichever one it is). Do you know which one supports importing folders from Thunderbird? I have used some of them.